Multi-panel room dividers can be used for decor-based intentions, practical privacy separation, and more. I've always wanted one but wasn't sure how to use it until I got a cat and found it perfect for hiding the ugly and often smelly litter box in my small space. 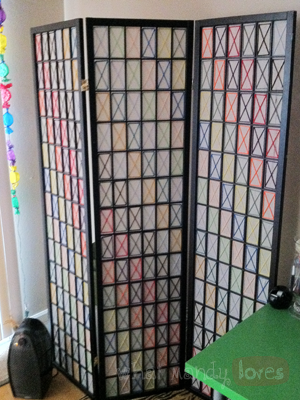 I purchased this divider at a thrift store for around ten bucks. It was in pretty good condition but parts of the thin cotton layer attached to the panels were frayed or ripped. My cat would also scratch it up a little when he decided he was frustrated with me. To top it all off, it wasn't exactly pretty in my eyes the way I bought it in its dull black and white self. It sure beats the litter box behind it, of course, but it needed something more. That's how I came up with the idea to sew on a pattern to hide - or at least mask - the rips in the cotton and bring out some much-needed color and style to this plain divider. 1. Start out planning what design and colors of thread you want to see in each panel. You could stick with one type all the way through like what I've done or you can more complex. The outward facing panels will show the main design, and the back sides of the panel can show a different design (even slightly show through the other side with enough light illuminating from behind. Just some things to consider. 2. Thread your needle with a good amount of whatever thread you choose to use. I used almost three feet of yarn for each square so make sure you cut enough. 3. CAREFULLY test your pattern on one of the bottom out-of-the-way and easily hidden squares near the bottom of your divider. This is just in case you mess up or decide to go with another pattern, so it's not as noticeable a mistake or redo was done. Make sure to leave a few inches on each end to tie off once it's done. 4. Tie off the finished square and take a step back. How does it look? Picture how this would look all over your divider. This is your chance to cut the thread away and try another pattern using the same holes you already punched into the thin cotton if desired. 4. Once you're set on the pattern or style, set a rhythm in how to weave the thread through the cotton. Gently work your way through one square at a time until each panel is filled in. 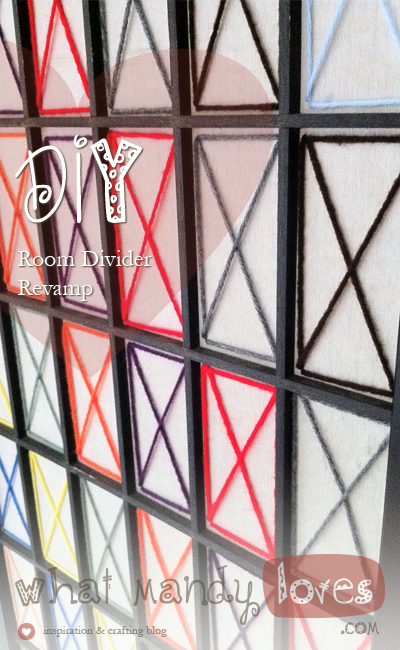 I suggest flipping the divider so you can continue the pattern from the top until you hit the middle, then flip it over again for easier access to the squares so you're not threading while lying on the floor. I stood most of the time and sat in a stool through the middle sections. This will take a while, I can assure you. Mine took a few hours a day for a few months total over a span of four months (mostly because my arms got tired easily and I have a day job), and my pattern is super simple. Be patient! It will look great when it all comes together. If you don't want to display the unfinished product, store it in a closet or something until it's ready to be revealed. REMEMBER: The cotton on these panels (especially the most popular type of divider like mine) is VERY fragile and attached with wimpy glue, so plan out your design knowing that too many HOLES in the fabric will cause the square to cave in and ruin your divider! My design of the X-shape consists of only four holes per square (threading several times through the same hole gently) to avoid a cave-in. Also, once you've got your plan, stick to it! Once you poke a hole, it's there forever and easily spotted with light shining behind the divider. Tell me what you think! This doesn't have to be just for poking holes into the cotton part. If you're unsatisfied with the cotton altogether, try ripping it out of all the panels (so you're left with just the wood or plastic grid) and weave fabric through the empty squares instead. It's something I'm thinking of trying, but I am unsure how it will turn out. Are there better ways to revamp a room divider? Try it yourself and show pics in the comments!